Summer Internship in Amsterdam. (Canal view). UX Designers, UI Designers, Data Scientists, Design Sprint Facilitators, Motion Designers, Digital Product Designers, AI Designers & Developers, Blockchain Designers & Developers, React & Full-Stack Developers, Interaction Designers, Visual Designers, Mobile Developers & Designers, Content creators, Business Designers, Growthhackers, Sustainability enthusiasts, Experience Designers, Editors, Prototypers, Solar punks. Say Hej! Have a nice day. 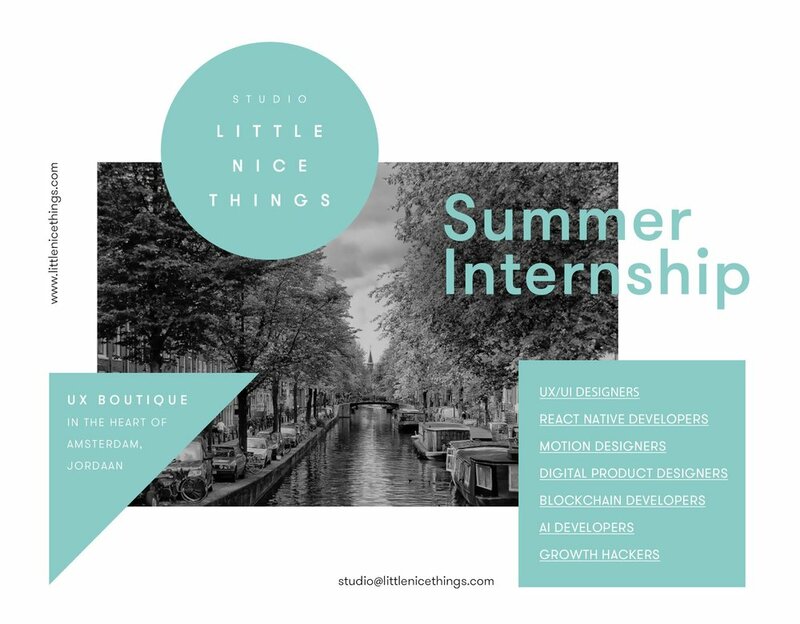 littlenicethings is a UX Boutique in the Heart of Amsterdam, Jordaan. We Research, Design & Develop meaningful digital products for AI & Blockchain startups, global & sustainable organizations.